Many of my followers wanted to know what kind of business is Carimin doing. Carimin: Carimin is renowned for its highly dedicated group of professionals from our management to our highly trained on site personnel in a full array of oil and gas industry services. The company provides skilled personnel to the oil and gas for both onshore and offshore projects and facilities from engineering and design, fabrication and construction installation and commission through to complete inspection and maintenance. Petronas: Petronas has more than 200 oil rigs and the cost per oil rig ranges from US $ 200-600 million, depending on its location. Offshore oil rigs are more expensive. Each oil rig can produce an average of 500,000 barrels of oil per day. Assuming the oil cost is about US $ 50 per barrel, 1 oil rig can produce US$ 2.5 million per day. All steel rust over time especially the offshore oil rig due to salty sea water. The company was awarded a Rm 1 billion service contract for 5 years from Petronas, average Rm 200 million a year. Besides this, it also has secured a 2 years construction contract valued at Rm 60 million from West Coast Express Highway. Carimin reported its 1st quarter ending 31 September 2018, EPS 5.01 sen. It is safe to assume that the company can continue to report similar profit every quarter for the next 5 years. Based on the excellent performance, it is most likely Petronas will award more contracts to the company. Based on the above facts, I believe Carimin will report similar EPS for the 2nd quarter before end of this month and the share price will continue to shoot higher and higher. Most likely it can report 5X4= 20 sen EPS for the current financial year. 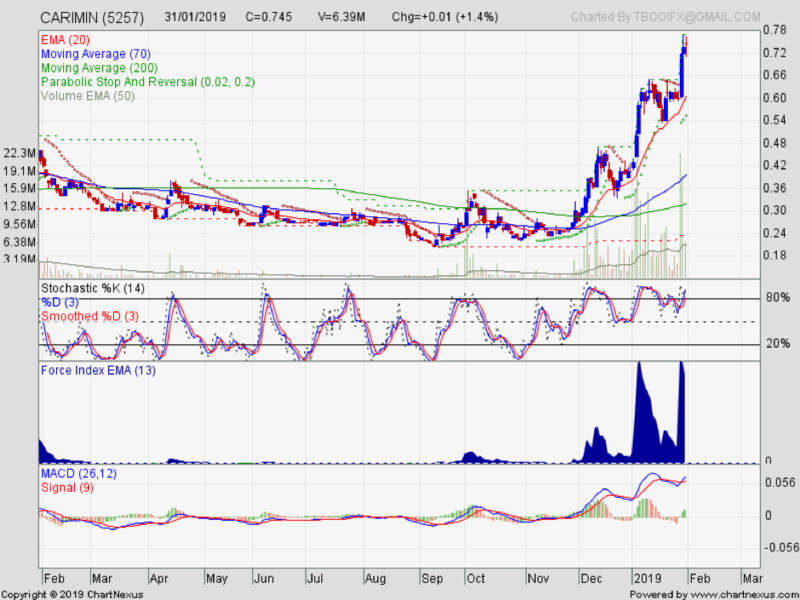 It should deserve to sell at Rm 2.00 equal to P/E 10. To be safe you can wait for its 2nd quarter announcement at the end of February. But you might miss the boat because there are many institutional investors with good foresight who are buying it aggressively. That is why the average daily traded volume exceeds 10 million shares. Many careful investors were waiting to buy after price correction and they are disappointed to see that the correction is so wild as shown by the price chart below. When I was a young boy, I was afraid to approach a pretty girl and I remember someone told me that a faint heart would not win a fair lady. It is similar in share investment, if you dare not take calculated risk, you will make a lot of money. As Carimin is my major investment, I am obliged to tell you that I do not need readers to buy to support the price because the daily traded volume exceeds 10 million shares. My purpose for writing this article is to provide more information to help investors make their investment decision.